Hey there! Just wanted to send warmest of wishes for a happy and safe holiday surrounded by those you love and cherish most! I’m a sucker for the Christmas season. Always have been. Don’t know if it’s the deluded optimism the holiday thrusts upon us, or just a strange affinity for otherwise maudlin songs dressed up as cheerful seasonal chestnuts. I mean, let’s be honest, at any other time of year, who would actually listen wistfully to a yawner like “The Little Drummer Boy”? Whatever it is, I have always ensured that my family gets into the holiday spirit, starting with finding the perfect Christmas tree. When I was a kid, the search for the ultimate yuletide tree took us to the nearest gas station: hardly a romantic venue from which to choose the centerpiece of our holiday decor. We’d pile into the station wagon for the three-block drive to Buck’s Esso station, spill out onto the oil-slicked parking lot, mull over three or four already-netted spruce trees, and then dad would haggle down the price. End of story. Ah, so I was determined to rewrite that tradition with my own family. Early in my marriage, we decided the most festive tree-acquisition could only be achieved by cutting down our own (plus you get the added benefit of the needles actually staying onthe tree all month rather than littering the floor). Because we lived in citified Northern Virginia, the cachet of escaping to the “country”–i.e. the closest remaining patch of farmland untainted by greedy developers–only added to the allure. That year, my husband and our three children, all under the age of four, trekked to the Clifton Christmas Tree Farm, where awaiting us were candy canes, hot chocolate, homemade wreaths and the typical abundance of forced holiday cheer that we craved. I had whipped my kids into a tree-chopping frenzy, and so they took their task quite seriously. 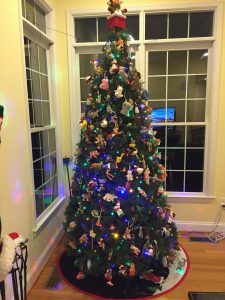 For forty minutes, we foraged throughout the whopping half-acre “farm” until we found the perfect tree: seven feet of holiday splendor, as wide as it was tall, perfect to fill our cathedral-ceiling’ed living room and flood us with the Christmas spirit. The kids took turns on the ground with the saw while my husband supervised the chopping honors. Their excitement was palpable. We dragged the tree back to the cashier stand where the farmer’s son coiled the netting around our white pine. The kids stood by, sucking on candy canes, sipping hot cider and petting the farmer’s dog, who’d recently wandered over. I was just about to retrieve the car to load on the tree, when Fido lifted his leg. “Noooooooo!” I shouted in what seemed like a frame-by-frame slow motion, as a steady stream was released onto our perfect tree. For a moment we stood stupefied, not knowing what to do. But we weren’t about to keep a tree covered in dog wee, so we grabbed the kids’ hands to head back into the wilds to hunt for a replacement one. Until our kids let us know in no uncertain terms, that this tree was the one, the only. They threw themselves on the ground, flailing and crying, thrashing and moaning, like something from a Greek tragedy. They wanted their special tree, and nothing else would suffice. Their wails did not subside until we relented, and agreed to load up the tainted tree. The farmer found a makeshift bucket, filled it from a nearby stream and doused the offending urine from the tree. We loaded it onto the roof of the car, and went home. I have to admit, I sort of detached emotionally from the tree that year. Couldn’t quite get over the psychological hurdle of having a tree the dog peed on in my living room. Somehow it clashed with the whole festive notion. But for my kids, the tree was just about perfect, despite its incumbent flaws. And maybe that’s exactly why I like the holidays so much: because at this time of year, we’re all a little more likely to forgive the small things in order to see the bigger picture. I’m writing this in my lovely little city of Charlottesville, Virginia, with this weekend bearing the ugly distinction of being the horrid one-year anniversary of what happened here last August when our city was taken over by monstrous neo Nazis and White Supremacists. I’ll be honest: I’m in good company here in Charlottesville in feeling sad and anxious and disillusioned that little has changed in the past year, but rather things seem to have only gotten worse in our country since that weekend. It’s a lovely day in the shade on the tree-lined Downtown Mall, normally a time when people would be anticipating a relaxing weekend, maybe grabbing a drink, then dinner at one of the many outdoor dining establishments all along the pedestrian mall. On Fridays there’s always live music in the outdoor amphitheater, with food trucks and local craft beers, it’s always a fun time. Most weekends the mall is peppered with street musicians and entertainers as well. It’s a place where people gather and enjoy one another’s company, decompressing after the work week. Tonight, the mall will be mostly silent. In the infinite wisdom of the NRA-owned Virginia legislature, if you are armed to the teeth, you’ll be allowed to open-carry your weaponry, feel as manly as possible. Yet you won’t be allowed to bring your puppy out to the mall tonight. Go figure. The mall will be mostly silent, in stark contrast to our “normal”. Usually Saturday morning means an early trip to the farmer’s market, always a lovely time chatting it up with farmers and friends and neighbors who make this a regular part of their weekend. Afterwards, my husband and I usually relax, drink coffee and read the paper outside a coffee shop on the mall. This week some kind local souls offered to relocate the cancelled market to a different location, in the hopes that the farmers will be able to salvage some of their vital income. Hard to say if we’ll be safe to drink coffee at our usual place, or if the monsters will have taken over yet again. We’re meeting friends for dinner tomorrow night and normally would likely go to a restaurant downtown, but one in the group is worried that tomorrow will be as horrific as last year at this time, so I guess we’ll have to play that by ear. I very much want to come down here and support local businesses who are still smarting from the financial losses they incurred as a result of the Nazi invasion, though I certainly respect those legitimate apprehensions. Last year, the Sunday of that nightmarish weekend was spent in mourning, gathering with friends and strangers on the mall, coming together with heavy hearts as we all tried to process the despicable events that happened in this wonderful little town. Right now, as I work outside a coffee shop on the mall, I’m watching a procession of hundreds of state troopers as they’re led to various points of presumed interest by their guide. Today they’re all laughing and smiling. Last year at this time, both during the Hitler-esque torch march on UVA Grounds on the night of August 11, and everywhere downtown on August 12, they stood stock-still and stone-faced as innocent people were brutally beaten. My friend’s daughter was cold-cocked in the face by a 40-something vermin of a man who’d come prepared, wearing brass knuckles. When video of that assault surfaced, I was quite stunned that her neck hadn’t snapped, the thrust of his punch was so powerful. Of course we’re all left to wonder what sort of odious demon of a man would do that to a 25-year old woman. It defies my ability to imagine. We’re all just hoping desperately that these haters, these instruments of evil, don’t return to Charlottesville for a command performance. Made worse still because many here have little faith that those in charge can or will stop it if they do return. So to be honest we are all on tenterhooks. It’s hard to get the barbarism out of my mind’s eye, the images of those hundreds upon hundreds—if not more—hate-filled, armed-to-the-teeth monsters relishing so intently their animalistic, sub-human impulses. Although I’m afraid they merely taught us how all-too-human their anger, their rage, their hatred is. Even worse is how it’s being exploited by those in power simply in order to cling to power. Throughout history many wicked leaders have known how effective it was to harness the power of fear and anger, and that’s where we are today in this country, and it feels so hopeless. I take solace in realizing that following the brutality of the Middle Ages, came the far more civilized period of the Renaissance. So maybe there is hope for us all. Maybe soon everyone who has taken up the cause of hatred and anger and rage will realize how exhausting it is to live like that, to live ruled by unfounded fear of those you don’t know. For now, I ask you all to take a moment to remember Heather Heyer, the young woman who was brutally murdered here last August by a maniacal neo Nazi who used his souped-up muscle car as a weapon to plow down innocent victims. Heather’s mother has been without her beloved only child for a full year now, and has to live with the silence of never hearing or seeing or hugging or kissing her daughter again. I hope you can take the time to hug your loved ones, and remember how good it feels to love, not hate. I’m just back from sitting in a dark hospital room for a couple of days with our son, who got a nasty infection in his elbow joint a week after cutting his arm. Thank goodness he’s fine, but had to spend a couple of days on IV antibiotics to try to knock out the infection so it didn’t go septic, which is why we dropped everything to go up to DC to be with our boy! Hospitals are not the place you want to be, that’s for sure. Happy my baby is on the mend and we’re back home. I’m now quite behind prepping for the release of my upcoming novel, Blue-Blooded Romeo, the latest in the Royal Romeo contemporary rom-com series, and trying to write Big O Romeo, which is due with my editor in two weeks. I’m currently reading American Fire: Love, Arson and Life in a Vanishing Land by Monica Hesse. I’d read a piece in the Washington Post about this crazy arsonist couple on the Eastern Shore of Virginia a few years back–one of those “you can’t make it up” stories. The reporter has since written this book and it’s a really compelling account of what happened, complete with all of the nutty local color you’ll get with books like this. If you listened to the Serial podcast and liked it, you’ll enjoy this. My friend Karen Dionne has a fabulous suspense thriller out to rave reviews this summer: The Marsh King’s Daughter. Highly recommend it. It’ll keep you on the edge of your seat. I LOVED Standard Deviation by Katherine Heiny. I have such metaphor envy after reading this novel. The author is extraordinarily insightful into the tiny nuances of the mundanities of life, and conveys them so wonderfully. The Season by Jonah Lisa Dyer was great fun. The authors are a husband/wife screenwriting team, and the book reads like a well-crafted TV show or movie. About a tomboy young woman who plays college soccer and her mother forces her and her twin sister to be girly-girl debutantes. Good beach read. The Assistants by Camille Perri was a fun beach read. I LOVED The Hating Game by Sally Thorne. Great beach read. Oh, The Nix is amazing. Fabulously talented writer, crazy ride of a novel–it goes down so many rabbit holes, you cannot imagine how they all connect, but they do! A few books I’ve started but have to get back to (but was enjoying! ): Eleanor Oliphant is Completely Fine by Gail Honeyman. Lillian Boxfish Takes a Walk by Kathleen Rooney. The Heirs by Susan Rieger. This is Your Life, Harriet Chance by Jonathan Evison. The People We Hate at the Wedding by Grant Ginder. I just heard about Those Meddling Kids by Edgar Cantero and can’t wait to read it. It’s a dark take on the Scooby Doo-type kid detectives who survive a harrowing episode that involves ghosts and dead bodies but when they grow up they’re psychologically scarred from the experience. When one of them commits suicide, the rest team together to face the demons of their past. Brilliant premise for a novel, right? I hope you’ll have a chance to check out my Royal Romeos series, which is a spin-off of my wildly popular It’s Reigning Men series–please do check them out!